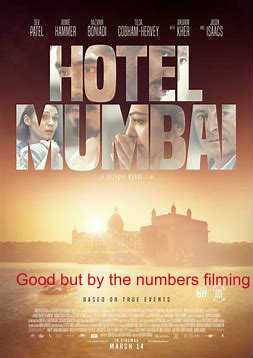 In November 2008 Mumbai, India, was under attack by 10 terrorists and "Hotel Mumbai" concentrates on the one that took place at the Taj Mahal Palace hotel. There is no getting away from the violence that took place and which takes up most of the film in graphic showings. This is Anthony Maras's directional debut and goes mainly by the numbers. Though he, and his co-screenwriter, John Collee, try to look into the stories of some of the humans involved there really is/was too much in what is/was happening. We do meet the 10 terrorists at the beginning of the film arriving at the Mumbai shore in a raft and watch as they go off to their assigned deeds constantly in touch with the leader of their Islamic terrorist organization who is called Brother Bull. He promises them money and Paradise in the name of Allah which gives him complete control of the gullible, vulnerable boys, young men. Dev Patel, who I saw in a much better, stronger role this week in "The Wedding Guest", plays a waiter at the hotel, married with 1 child and another on the way, who really needs the job but that's all we really get to know about him. There is his boss, Anupam Kher, who I really l like in the TV series, "New Amsterdam", playing the head chef and boss of the restaurant who we really don't find out much about except he believes the 'Guest is god' and won't accept less from his staff. There is Armie Hammer, with his young Indian bride, Nazanin Boniadi, their young baby and his nanny, Tilda Cobham-Hervey not to forget the mysterious Russian guy Jason Isaacs, who you wish the terriorist would 'take out'. Yes, true story or not, there will be those you don't want to die! In spite of the high body count, and the violence, the movie moves fast, has some suspenseful moments and, if you didn't know anything about those attacks, I didn't, it's a lesson on what is going on in other parts of the world that will wake you up to the fact that we are not alone.